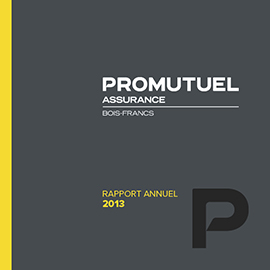 Promutuel Insurance Bois-Francs: we insure you better. 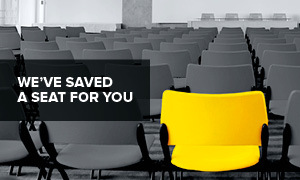 We've been insuring people in Victoriaville and Asbestos for so long, we know your needs better than anyone. That's why we can offer you the best home, car, business or farm coverage for your budget. Welcome to Promutuel Insurance, your home away from home! 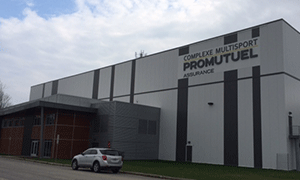 Insured members of Promutuel Insurance Bois-Francs are invited on Sunday, March 24, 2019 at 10:00 a.m. to the Hôtel Le Victorin – Centre des congrès. A brunch will be served after the meeting. Insured members, please RSVP by March 13, 2019, to our receptionist, by email at boisfrancs@promutuel.ca or by phone call at 819 752-5000, extension 0 or 1 800 463-3829, extension 0. In case of cancellation, the meeting will be rescheduled for Monday March 25, 2019, at 7:30 p.m. and same location. We hope to see many of you there! Please consult the meeting notice (french only). Voici la gagnante du concours! Elle a rempli un bulletin de participation à l’espace promotionnel animé par les agents en assurance entreprise de notre mutuelle dans le cadre de cette journée qui s’est déroulée le 11 janvier 2019 à Victoriaville. 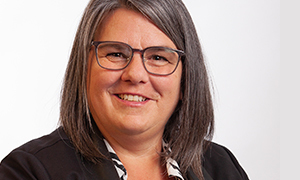 The board of directors of Promutuel Insurance Bois-Francs is pleased to announce the appointment of Suzan Francoeur as general manager. 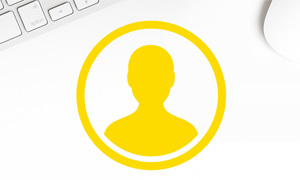 Ms. Francoeur has worked in the insurance industry for over twenty years. She has held various positions in sales, governance, and customer experience with leading insurers. Welcome! 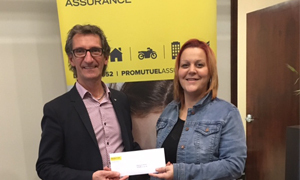 Promutuel Insurance Bois-Francs is proud to announce the winners of its “Take a Payment Holiday for 1 Year” contest: Mr. Alain Caron and Ms. Danielle Giguère of Victoriaville. Congratulations! They became eligible for the contest after completing an online survey between March 15, 2017, and February 15, 2018, following a claim settlement. Ms. Danielle Giguère and Mr. Alain Caron, who are insured by Promutuel Insurance Bois-Francs, have each won a one-year home insurance payment holiday. Here they are with Ms. Christine Hubert, Claims Director. We are delighted to acknowledge two inspirational leaders, Robert Lefebvre and Claude Pépin, insured members with Promutuel Insurance Bois-Francs, who have been inducted into the Agriculture Hall of Fame. Their dedication, perseverance, and excellence have been a tremendous asset to agriculture in Québec. Bravo for your leadership and commitment! The region is proud of everything you have done for the farming industry. Your recognition is well deserved. 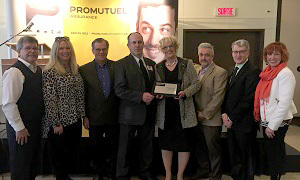 At the AGM on March 25, 2018, board chair Suzanne L. Mailhot and the Promutuel Insurance Bois-Francs directors expressed their gratitude to former board member Claude Normand. Claude spent 19 years working for the good of the Mutual, including five as vice-chair of the board of directors. He was presented with a plaque and a basket of maple products. Insured members of Promutuel Assurance Bois-Francs are invited on Sunday, March 25 at 10:00 a.m., to the Hôtel Le Victorin – Centre des congrès. A brunch will be served after the meeting. Insured members, please RSVP by March 14, 2018, to our receptionist, by email at boisfrancs@promutuel.ca or by phone call at 819 752-5000, extension 0 or 1 800 463-3829, extension 0. We hope to see many of you there! 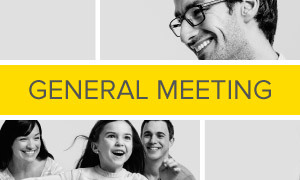 Please consult the meeting notice (french only). 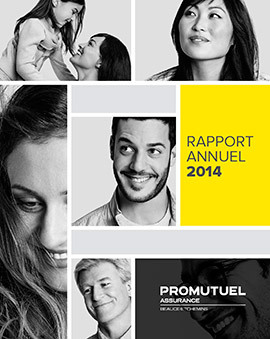 In 2017, general manager Raymond Beaudet and director of sales and business development Pauline Durand from Promutuel Insurance Bois-Francs were named as honorary co-presidents of Répit Jeunesse. The organization helps troubled and homeless youth age 12 to 30 by supporting and guiding them on their way to becoming self-sufficient, socially engaged individuals. Promutuel employees also raised $2,500 for the cause by donating $2 each week to wear jeans for Casual Fridays. 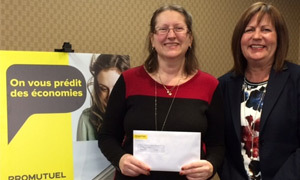 Promutuel Insurance Bois-Francs is pleased to announce the winner of its “Take a Payment Holiday for 1 Year” contest, Victoriaville’s Annie Arsenault. To qualify, we invite our insured members to complete a customer satisfaction survey after a claim is settled. 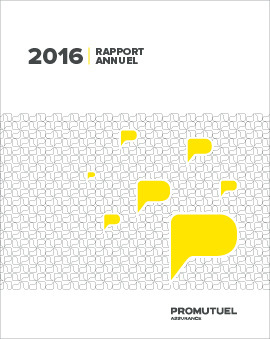 A winner is declared each year from among our members who complete the survey. CONGRATULATIONS TO OUR HOME THEATRE WINNER! 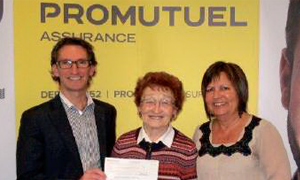 Promutuel Insurance Bois-Francs is pleased to announce the winner of the “On vous prédit un beau prix!” contest held during the 2015 Holstein Quebec picnic at Fleury et fils farms in Victoriaville on July 10. 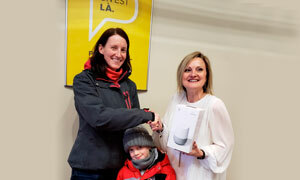 Congratulations to Marc Coursol of Ferme-Neuve, winner of the home theatre! His name was selected in a random draw the week following the picnic. Promutuel Insurance Bois-Francs is pleased to announce the winner of its “Take a Payment Holiday for 1 Year” contest. 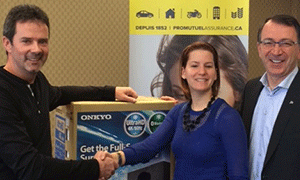 Johanne Provencher has won the payments on her vehicle premium. Congratulations! To help us continually improve our services, we ask our insured members to fill out a satisfaction survey after they make a claim. Every year, we hold a draw from among the respondents. 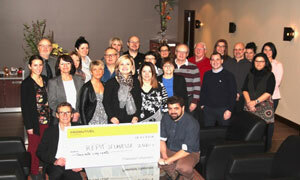 Promutuel Insurance Bois-Francs was at Salon de l'habitation Kinsmen, held March 13 to 15. During this event, we held a contest and collected entries from visitors. 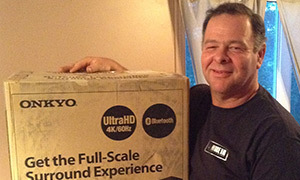 Congratulations to Christian Lecours of Victoriaville, our proud winner of a home theater! 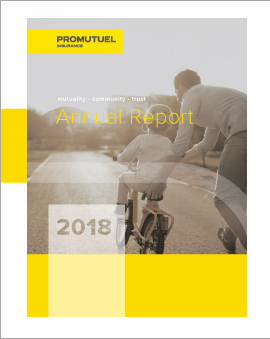 At its annual general meeting on March 8, Promutuel Insurance Bois-Francs unveiled positive results for the fiscal year ended December 31, 2014. 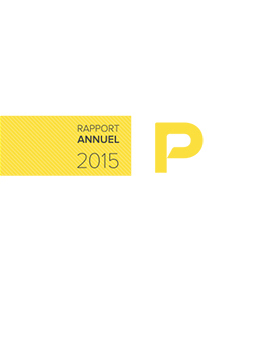 Growth is the name of the game here and our future has never looked more promising! For more details, see the press release (in French only) on this topic. Sometimes it takes a diagnosis for people to realize how important health is. That’s what motivated the entire team at Promutuel Assurance Bois-Francs to participate in “jeans Friday” by giving $2 each week. On May 26, Raymond Beaudet, General Manger, remitted a cheque for $2,092 to Annick Bergeron, of the Relay for Life. They were joined by a few employees who proudly participated in the fundraising campaign. Mr. Roger Béliveau of Warwick is the lucky winner of our Join Your AGM! Contest, held on March 16. 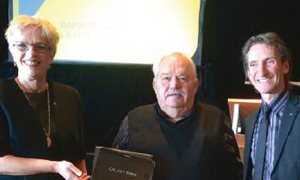 The photo shows Mr. Béliveau receiving his prize, a 10-inch Samsung Galaxy tablet and case, from Ms. Suzanne L. Mailhot, Chair of the Board of Directors of Promutuel Assurance Bois-Francs, and Mr. Raymond Beaudet, General Manager. Ms. Jeannine Hinse is the winner of our Take a Payment Holiday for 1 Year Contest. She wins a payment holiday for her car insurance premium. In the photo: Ms. Hinse, Mr. Raymond Beaudet, General Manager of Promutuel Assurance Bois-Francs, and Ms. Christine Hubert, Director of Claims. 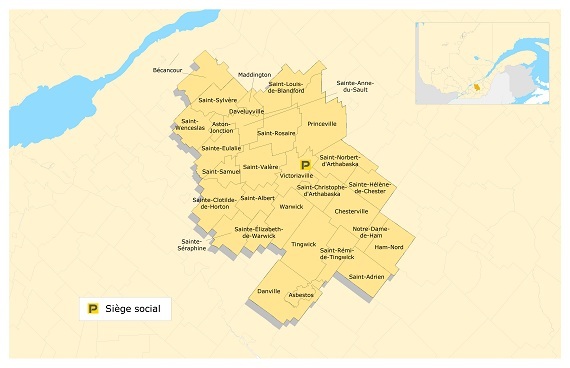 This partnership between the Commission scolaire des Bois-Francs, the City of Victoriaville, the CEGEP and Promutuel Bois-Francs will highlight our shared values: promoting the development of young students through sport, increasing population retention and attracting new residents. This project shows how partnerships can meet the individual needs of stakeholders and provide benefits for all. 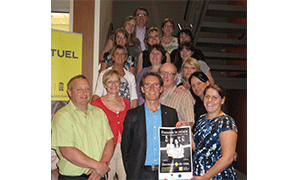 Promutuel Bois-Francs is now a proud partner of Victoriaville’s sustainable living project. This environmentally friendly and energy-efficient construction and renovation initiative allows insurance customers with a 3-, 4- or 5-star rating to get an extra 10% off their home insurance and 5% off their passenger vehicle insurance. 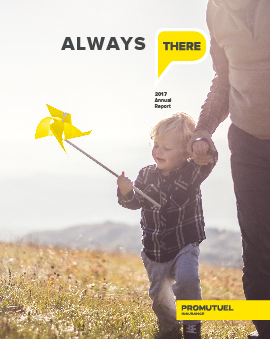 Thanks to a network of financial security advisors, Promutuel offers its insured members access to a wide range of life and health insurance products. 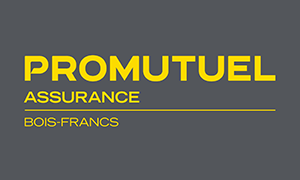 The roots of Promutuel Bois-Francs date back to 1899, when Mr. François-Xavier Desrochers founded the Fire Insurance Mutual Company of the Saint-Médard de Warwick parish. Some 40 years later, this parish mutual merged with the Mutual of Arthabaska and other mutuals to form the Fire Insurance Mutual Company of Arthabaska county. They would undergo several name changes over the years in order to conform to the restructuring of the insurance law and the resulting broadening of their mandate. In 1978, the Mutual purchased land on a main road in Warwick in order to construct its head office. In 2008, the Mutual Association constructed a new building in Victoriaville to promote the development of the municipality. A few years later, it moved its Head Office to this location and closed its office in Warwick. *Our call center is open Monday to Thursday until 7:30 pm. *Our call center is open Monday to Thursday until 7:30 pm. The office is closed between noon and 1 pm.